This motorcycle is powered by four off-the-shelf batteries. 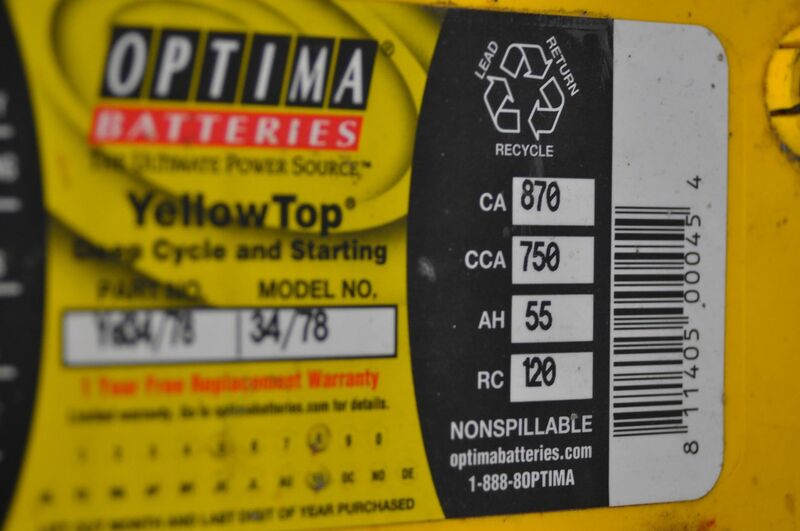 They are Optima Yellow-Tops, rated at 55 amp-hour capacity, and cranking current of nearly 900 amps. They are AGM – absorbed glass matt. That’s a style of lead-acid battery that is sealed up and the electrolyte is soaked into coils of fiberglass matting. They cannot leak, spill, or slosh around. While there are other types of batteries available, this seemed to be the best combination of price and performance for my project. “Flooded” lead-acid batteries are really not acceptable for a motorcycle. Besides being challenging in adding water, the movement and possible tipping-over of a motorcycle would not be good for flooded batteries. Going back to some simple math, we can get an estimate of motorcycle range. I have four batteries, each of which is 12 volts, but they are wired up in one series string of all four of them, so it’s really 48V in total. Lead batteries are NOT light. It helps to make a mock-up from foam or cardboard, so that you have a LIGHTWEIGHT, easy-to-handle version of the battery to experiment with. I like to think of this as the poor-man’s C.A.D. If you are into computer design, there are many great programs out there to help you create 3D images and think in three-dimensional space. Google Sketchup seems to be getting fairly popular. Still, you really can’t beat an actual, physical object in your hands. I just prefer something that weighs less than lead. Here’s a little video for you explaining one way to use cardboard to make your life easier designing and working on your electric motorcycle. Hey! I liked this design …. I am a college student and would like to reproduce this design …. I’m Brazilian, so now I’m sorry for my vocabulary ….. I have a question for you …. Only 26.4 miles? I think there must be another way for the use of battery life, so that the engine go to be better, I wonder if lithium is a good idea to improve performance, 26.4 miles is not legal. Do you can response for me? The RANGE or distance the motorcycle is designed to travel is between 20 and 30 miles per charge. The top speed it is designed for is 45 miles-per-hour. I don’t know how the RANGE can be illegal. In the United States, there are speed restrictions on major high-speed roads, such as Interstate Highways. Lithium batteries would allow for longer range. They are also more compact. By adding more batteries to the cycle, you would increase the system voltage, and on a DC (Direct Current) motor, such as this cycle uses, higher voltage means higher speed. It would also be possible to simply change the gearing, without changing anything else. That would allow higher speed, but in exchange for range. I use my cycle in an area with 25mph and 45mph speed-limits, so I geared the cycle for a 45mph top speed and a useful amount of range. If your requirements are different, you can build your cycle with lithium batteries, higher voltage, larger capacity batteries, and different gearing. I went to the Optima battery website. It seems that the blue top batteries would be more applicable, as they are marketed for trolling motors and such, whereas the yellows are meant for starting cars. Do you have any input on that? shoot, I am mistaken, I spoke too soon, the Blue’s are not meant for deep cycle, never mind!. I like the saddle bag idea though. Giant saddle bags with 4 batteries on each side of the wheels would be quite the sight with quite the range! Red-Tops are the starting battery. My understanding is that both the Blue-Top and Yellow-Top are internally the same, they just have different power connections on them and are marketed differently. 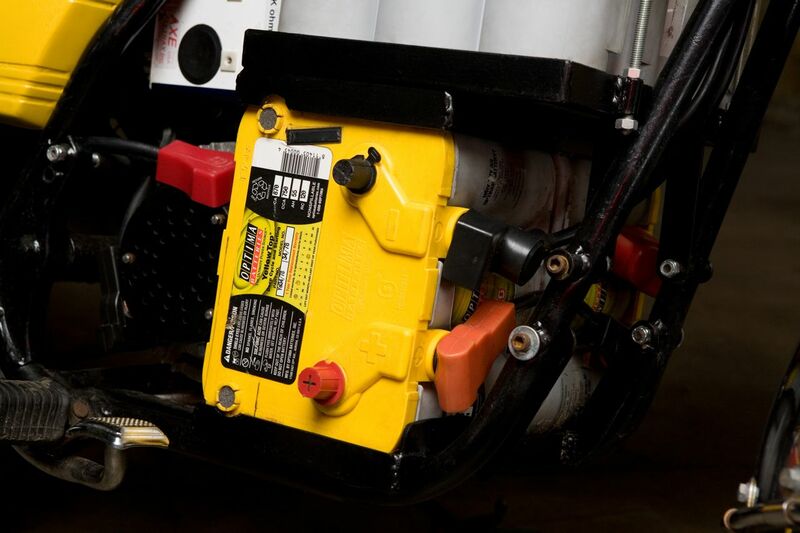 There are diminishing returns with the size of any lead-acid battery pack. It makes more sense to go to lithium batteries than really loading up with lead. I built the motorcycle about five years ago, and lithium battery costs have really come down since then. On the other hand, you can get lead-acid used/cheap and it’s great for learning, experimenting, and a practical local vehicle. Hi I’ve been watching your videos and it has really inspired me to build an electric motorcycle I’d like to try and hit around a 40 to 50 mile range. I want to use the same 4 yellow top battery set up that you have and I am wondering is it possible hook up smaller sized 12 volt batteries to the bigger yellow top ones so that I can get a little more range and it would be easier to find room for a would extra smaller batteries. Is something like this possible? For a 40-50 mile range, you probably want to go with lithium batteries. They keep coming down in cost, and the smaller cells are easier to fit to the shape of a motorcycle frame. If you are using lead acid, you want to keep the batteries all the same size. Batteries of different sizes have different capacities, which which will make them harder to charge. If they are in series, the smaller batteries would limit how much capacity of the larger batteries you could use. Hi… How do you connect the Batteries correctly to increase the Voltage (V) in Series..? Also, what does the CCA stand for? I believe… Cold Cranking Amps? How about the RC and the CA? Those Yellow Tops are showing MASSIVE AMPS… @ least 750. Does that mean they are putting out that much consistent AMPS? My Electronic Speed Controller (ESC) is only good for up to 20 AMPS… and with the Still Pretty High Cost of Lithium Ion… I was just wanting more clarification of the Discharge Amps with these Batteries and how that would work with SO MUCH AMPS being Discharged… Unless, that is not what the CA and CCA stand for?? I have actually found 12V @ 10AH (lightweight) AGM Batteries.. but again are most likely putting out too much AMPS for my Application… Please advise… Thanks!